Read part one to learn how the historical figures continue influence the modern-day design leader. In Learning to Fly, part one of the Wright brothers series, I reflected on my love of biographies. Though I’ve long enjoyed reading them, it’s only recently that I realized the extent to which I can apply the lessons in these mostly historical books to my current life as a product design leader. I found The Wright Brothers, about the men at the turn of the 20th century who built the world’s first airplane, to be particularly full of guidance. My first piece included lessons on finding a team that challenges you, cultivating a sense of curiosity, and the fruits of constant iteration. But that’s not all we can take away from this inventive duo. Another remarkable part of the Wrights’ story is that the work on their flying experiments would be classified today as a side project. Their day job was running Wright Cycle Company, a busy and successful bicycle manufacturing company, retail store, and repair shop that they started in 1892. In 1896, during a bicycle craze — America’s collective enthusiasm for bicycles — the Wright boys began manufacturing and selling bikes of their own design. They were so successful at this that they did not need to solicit or receive any outside investments for their flying project — what today we would call venture capital. The major player in the nascent airship design and manufacturing sector at the time was Samuel Pierpont Langley, who, in 1898, secured $70,000 (what would be $2 million today) in funding from the Smithsonian and the U.S. War Department to develop a piloted airplane that he called the Aerodrome. Unfortunately for Langley, his machine—and therefore his funding—ended up being lost in the waters of the Potomac with the failure of his first (and last) attempt to get the Aerodrome aloft. While the Wrights practiced constant patient iteration of their work, Langley spent the majority of his time and money on one big bet. In contrast to their competitor Langley, all of Orville and Wilbur’s pursuits were entirely financed by the bicycle business. But financial gain for their invention was mostly irrelevant to the Wrights. They knew they were doing something of historical and scientific importance. On December 17, 1903, just eight days after Langley’s spectacular failure, a brilliantly well-designed machine that cost only around $1,000 to create climbed into the skies of Kitty Hawk, North Carolina, establishing for all time the Wright brothers as household names (and even more successful inventors and businessmen). Just as the Wrights self-financed their work, designers today can get started with very little in the way of investment. Design tools have become democratized and inexpensive. You can purchase a modest laptop and low-cost but powerful software and learn most of what you need to know from Skillshare or YouTube. The cost barrier to entry in the digital design world is incredibly low. Don’t wait for the right time to create your killer app or start your dream company. Start right away — all you need is the inspiration, and that, I would argue, lies within a book like David McCullough’s The Wright Brothers. 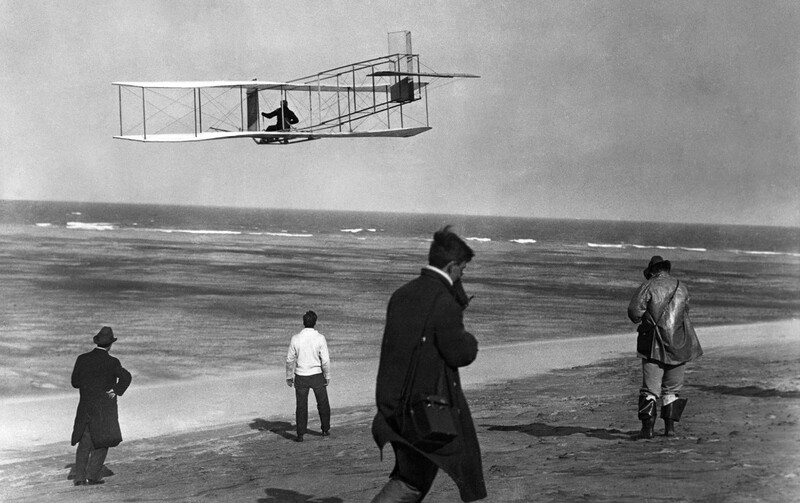 Left: The Wright Brothers at Kitty Hawk. Right: Wilbur Wright, Pau, France, 1909. It was not particularly surprising to me to read that the Wrights kept detailed diaries and notebooks, as well as writing extensive letters analyzing their learnings and accomplishments. What was incredibly fascinating to me was their embrace of a then relatively new technology called photography. The men made a very deliberate decision to create a photographic account of their work. In large part, Wilbur and Orville were aware of the importance of photographic proof of their accomplishments, both scientifically and historically. They purchased their first camera around the same time that they began their gliding experiments. The camera, a Korona V, was one of the most high-quality and expensive cameras of its time, costing $85 — a considerable sum of money at the time. With photography, as with nearly everything, the Wrights taught themselves and became extremely proficient. They built a darkroom in a backyard woodshed of their Hawthorn Street home in Dayton, Ohio, where they developed their glass plate negatives and made prints. Their camera was no iPhone — it was so large and cumbersome that it had to be mounted on a tripod and took only one exposure at a time. Yet in the midst of running a bicycle company and performing experiments with flying machines, they not only taught themselves but actually embraced a brand-new technology. Having an open mind to try new tools and methods for doing one’s work is critical. The Wrights were able to employ new and innovative technology to document their work. The tools of software design, prototyping, and research have improved dramatically even in the past three to five years. To be effective designers, we must continually stay on top of the latest advancements and be ready to try new things. The Wright Flyer’s first flight traveled 120 feet in 12 seconds — Orville Wright is at the controls, while Wilbur is running alongside. The Wrights initially worked out the solution to each challenge on paper and then created small-scale models before spending the time and resources to build full-scale machines. They addressed each problem — for example, weight, lateral balance, a moveable rudder, and pitch control — one at a time rather than trying to take on the whole project all at once (as Langley and many others had). Finally, they constructed the first viable airplane primarily out of wood, fabric, and wire, and by doing so, they demonstrated the validity of their design in an elegant, efficient, and inexpensive way. Learning how meticulous the Wrights were in their attention to detail has inspired me to lead my team to follow in this tradition. True craftsmanship is designing with mindfulness, attention to detail, and passion. It’s crucial to take great care in creating our artifacts, screen designs, and user flows so that we can put the best product in front of our users. Doing so requires us to be mindful in all aspects of our work, especially in how we articulate and present our ideas to our cross-functional partners and stakeholders. As designers, we must get our partners on board in seeking and finding solutions. By doing so, we avoid the risk of seeing our work built in different ways than we intended or, worse, not being built at all. Orville Wright making a flight by spectators on the beaches of Kitty Hawk, North Carolina. When the Wrights made their historic first flight, it was barely noticed. James Cox, the publisher of the local Dayton newspaper, later confessed that he and his staff thought the stories of the flights were fake, so they never followed up on them. In fact, the first comprehensive account of the Wright brothers’ successes would come from Amos I. Root, a beekeeper and flight enthusiast, who published the story in the 1905 edition of his journal, Gleanings in Bee Culture. Hardly a shot heard ’round the world. Despite the almost total absence of publicity about their work, Wilbur and Orville began pursuing deals to capitalize on their groundbreaking design. In 1903, after filing their first patent, they offered their invention to the U.S. government. The government declined to respond, most likely because of the substantial money it had lost in the Langley debacle. The Wrights then approached both British and French interests. Eventually, in December 1905, they struck a deal with a team of businessmen from France that netted the Wright Brothers $200,000 for the designs of their aircraft. The Wrights started a mission-driven company. Their goal was to develop a solution for powered flight and bring that solution to the world. They weren’t seeking publicity or a quick buck. They merely felt that powered human flight should be possible to do, and they believed they were the ones to do it. Success wasn’t their goal. Instead, their success was a result of their hard work and commitment to their vision. When choosing a career path or a company to work for, it’s usually best to go in the direction our dreams take us. I seek to work with designers who are inspired by their dreams. I endorse finding the things that challenge you and bring you fulfillment. That way you’ve won whether you make a killing or not. Wilbur Wright flies over the Hudson River and around the Statue of Liberty, September 29, 1909. The story of the Wright brothers is one of continual improvement and iteration. Even after notoriety and financial success, the pair continued to work and tour around the world, perfecting their craft and improving their designs. Success and riches didn’t alter their even and steady personalities and their lifelong commitment to precision, craftsmanship, and hard work. In June 1909, within 48 hours of President William Howard Taft presenting Wilbur and Orville Wright with gold medals in the East Room of the White House to commemorate their achievements, they were on their way to Fort Myer, Virginia, so that Orville could finish working on the speed and endurance tests that would help them finalize the sale of one of their aircraft to the U.S. Army. The Wright brothers always remained humble and committed to improving and perfecting their work. Let’s follow their example and seek out challenging partners. Let’s be creative, curious, and willing to learn from others; let’s have the intellectual rigor to test our assumptions and perfect our designs; let’s strive for boldness and remain committed to our visions; let’s be disciplined by documenting our work and learning from past mistakes; let’s always take pride in every detail of our work; let’s make the realization of our visions our goal; and, above all, let’s remain humble and keep going, constantly striving to improve our craft and the products we design. Make sure to check out Part One in this series for more on what designers can learn from the Wright Brothers.